There’s a long-standing misconception (in Ray Sidney-Smith‘s humble opinion) that habits are how you become more productive. But, it’s actually your routines that power your habits, and therefore, your personal productivity. 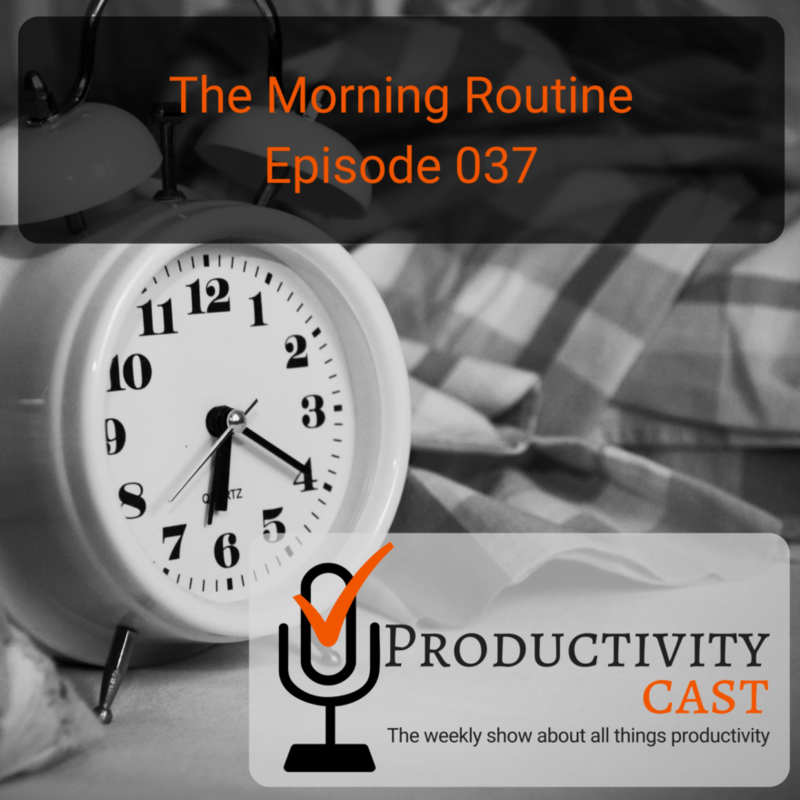 In this episode of ProductivityCast, we discuss the power of routines, and specifically look at the morning routine. We discuss each of our morning routines and discuss some challenges facing building a good morning routine. but they still need to happen, rituals are much less forgiving, and much more structured, at least that’s my assessment. I don’t really want to think about what I’m doing in the sense that I have to choose, what should I do for what should I, I don’t want to make those choices, they should have been pre made, if it’s a good routine, and all I’m doing is just kind of mindlessly following them in order to achieve some state. my best exercise, I don’t exercise really any time other than in the morning, that’s the only window that I have available practically. And then second, it’s also the time when I enter the flow state, the deepest I do my best creative work. So there’s, there’s a, unfortunately that they, they compete for the same block of time between about 5am and abodes 12, about one o’clock, I sort of Renata totally run out of steam. So it’s a, it’s a, it’s a careful dance that I’m sort of trying to orchestrate so that I get my exercise done. And I do my best work between the two. So somebody is like, to Tuesday’s Sunday’s juices. And Sundays are the days that I I most most exercise, so to speak, because I joined a group and I go riding and this one’s starts at 4:30am on the Tuesday at 6pm on a Sunday. And, and these are kind of strenuous rights, they’re not they’re not, they’re not, they’re not casual, you know, beginner, and these are, these are the fast and if you don’t, if you don’t, if you’re not sharp, you’ll get dropped off at the end. And that means riding home in the darker you know, office thing. So you sort of have to be at your best on these rights. So for those two days, I’ve given over to exercise completely but for creative work. So this today is Monday and we’re on our usual Monday creating the podcast call. So Monday mornings, Fridays, some Saturdays, the day is very depending on on on sort of my schedule for the week. But my intention is to to spend either my time either doing lightweights on the other days, or get an or getting into the flow state as deeply as possible for as long as possible to do my best work. So I don’t try. I don’t check email until after lunch. Or I don’t process email until after lunch. I may check if I’m expecting an email that may change the course of the day. But the point is to end up at around one o’clock, sort of physically and mentally depleted, so to speak, where I’ve given my absolute best I’ve been sprinting, either physically sprinting on a bike or running or I’ve been mentally sprinting, because I’ve been doing something creative. My I tried to script my morning sort of very carefully and heavily and, and tried to prevent disruptions and distractions and phone calls, I’ll put them off to the afternoon. I don’t take meetings in the morning, if I can hit pit. I can see that I can see that so. So I’ve a couple questions. At some point in time, you you likely came to this decision about your morning routine. And I’m curious about when that happened in your world what what kind of what precipitated the decision basically, what precipitated the awareness that that needed to be for you the most productive morning routine. when I learned about the flow state, and started to observe my ability to get into it. I think, as I reflected on it, it was very rare, very rarely happen in the afternoons, for whatever reason, and I definitely know that night, some other night person, I’m a morning person, for sure. So as I started to learn more about myself, this is maybe the early 2000s, I think, I read the book floor and, and started to incorporate it into my life and started to use the ideas in mid 2000s. And I became very particular about what I needed to put in place to enter the flow state. because I become more strict about locking locking into the flow state the overtime so that’s that, that nothing prevents me little prevents me from getting into it, if I really need to get into it. Nothing short of an emergency. So maybe that’s it, those are the timeframes. Thank, you know, I appreciate that. I think it’s good for us all to be aware of when we become aware of these things. And for those of you who are listening, if this is the first time you’re really thinking about a routine, especially in the way in which we have all co defined them both the same and differently, this is the time in your life to really start to think about what are the activities that are your passion, that are things that really define you in the sense that you define you by deciding on what these passions are, and in Francis’s case, it was this physical activity that really drives the rest of your routine or, you know, rounded, it helps you whether it whether it’s distress, prefer, well be excited by life, and that has helped it’s threads them together. And I really like that, I really like that. Thank you. minds, hey, you know, it’s wonderful. It sounds great. I would love to spend that much time on my but for me, it’s a different beast. Because of just the nature of my work. Being being a consultant, my time is pretty much constricted by what my client once so I have a very, I don’t want to say very short, I have about an hour window of opportunity that I’ve established at the very beginning of the day between seven and eight o’clock. And that window of opportunity is what I consider my dashboard time I’ve created a routine of change hacking all of the different systems and sets of information that could potentially affect me during the course of the day I do, which is like the cardinal No, no, I actually look at my email quickly during that time period, and see Is there anything on fire otherwise, move on to the next I check my news feeds very quickly, I go through my to do list, I check audit reports, I share all the information that I need. But I don’t take action on any of it. It’s literally just take that time period to go through and understand everything that’s going to potentially impact that day, and all the information that I need. It’s evolved in a weird manner, though, because I used to do it as we’ve talked about in the past. And it really doesn’t, it’s not tool specific. By going through the course of a day, I found that there’s something that I need to check frequently could be anything could be your bank account. Let’s take that as an example. So you want to check that every day? Well, you get into this habit of checking it sometime during the day. But the days that you forget that for me, that was an issue because I need that piece of information, not because I really need it. But because I feel weird if I don’t have it. I like to know everything that’s going on all the time. So by establishing this block of time in the morning, this basic dashboard time, I take those items like Check, check my bank account and move it into that time window. Because I know it only takes 30 seconds maybe to go through and quick check. But it’s done, it’s accomplished. And I have that information in my head. And I can move forward. So by allocating that block of time, I now can go through the rest of the day, knowing that I don’t need to check all those things. And I can focus on changing and dynamic projects and activities. for me, it wasn’t really this grand awareness of all the sudden did I read a book and all the sudden I have a routine it was more a crap, I missed that again, oops, that didn’t get done again. Or this fell through the cracks again. And I needed a way to start to move things together so that they didn’t get missed. And it was truly an evolution far more than it was a realization, I started doing a couple of things at the same time, all the time. And they worked. So I’m like, Okay, well, I’ll do another thing that same time, and I’ll do another thing and it just continued to grow and grow. I don’t recommend that for everybody. Because it can spiral wildly out of control. If you’re not careful, you can try and cram too much in in that that little early time period. you know, just something I want to throw out here real fast. If you listen to our the three of our routines, something that everybody should take away from. The fact is that morning routines are not the type of thing that get included in your annual review at work. These are personal, they should be considered personal, you may have a routine of things that you do at work. But this is truly what makes a difference for you, as an individual, take hold of that fact. And revel in that fact that this is your point of control over how things are working. Because often you don’t have that in other routines that are kind of inflicted upon you. You know, if you look at children, children have a routine that you have to follow with them, or else they wind up wandering around the house with one sock here, you’re more thinking about what’s going to make me more successful at what I’m doing and feel better about what I’m doing. Definitely. there I think it was a point before I realized that I needed to hit a particular kind of state to be productive. So before before, then I would just jump up and do whatever. So this is way back in maybe the early 90s before I started the triathlon stuff. So I didn’t have a demanding workout schedule that I needed to follow in order to produce a result, it was more matter of just responding to whatever happened the day before, and whatever I slept on that night, and I would jump onto the bed and just start whatever exercise I felt like it or work if I felt like it, or there was no sort of design to what I was doing, it was just very random and not well thought through. would I would add to that art that you have some kind of quick or immediate feedback loop as it relates to whatever that thing is that you’re doing. You should be able to know that you completed some portion of it and know how well you did it almost immediately, you should be able to brush your teeth, and then be able to know that you brush your teeth. Well, you know, go go kiss your spouse or partner. You’re right. That feedback loop is critical. And even if it’s your own, even if it’s like, Yes, I got the information I need move it on that it could be something as simple as putting all the items in your routine and a checklist and being able to check that box. That might be your feedback loop. That’s what I have. And it gives me that opportunity. You say, Yep, I did it or no crap, I didn’t do it. And then you can move on from there. But you’re right, you’ve got to have this is where truly trusting your system can make all the difference in the world. Because if you’re having to think about working your routine, then you’re just working. you mentioned, one traveling is a is a major major disrupter. And when I travel my routine, if I’m not very careful and very aware, minute routine goes the heck moving is another one if you move house survival lots of times over the years. And it takes big time discipline to re establish a routine because a lot of what I’ve discovered is not a lot of my routine depends on sort of physical activity, how I get out of the band, what I do first, what I do second, where the location of those of those items or tasks are done, because my body moves sort of along a groove early in the morning. And when I move it doesn’t follow the same groove. And it takes a month, two months, three months for me to re establish a new groove so that the behaviors and the routine can reestablish itself. So there’s, there’s that there’s sort of a grace period, I guess I have started to give myself that I’m traveling to know that my routine is probably going to fall apart. And if I move, it’s going to take a month, two months before I get into a new set of physical motions that then trigger the right behaviors that then trigger the end state that I want to accomplish. I think that’s useful to know what people that so that they didn’t have to hide himself when their routine changes. And they don’t know why they’re not as productive as they were before. I couldn’t agree more that that travel for most people is going to be disruptive. And it is for me, and it is actually something that I don’t like about my work. It’s it’s something that I do, because I I love what I do. But the reality is, is that that having to be away from home constantly going from one location to another does create its own productivity disabling and the reality is, is that it’s a it’s a lot of time and energy that has to be spent making sure that I can still be productive in transit. And then in different environments, where my brain typically wants the same location to do the same types of things. And that may not be the case from a week to week basis. And so it’s very difficult for me, the reality is, is that you need to create your own space, wherever you are, to be able to give yourself as many of the same features, the same clues that what you’re working on is in the same type of space, categorically speaking, as opposed to the same exact location with the same exact resources at all at all times. Because it’s just not not possible. So as it relates to your routine, I would say some of the challenges that I that I’ve faced over time was trying to do all of the personal hygiene things at one point in time. And then realizing that that didn’t quite work out as best as I wanted them to. So for example, I wanted to be able to get up, drink a glass of water, brush my teeth, wash my face, take a shower, all of that stuff all at one time. And what I realized was that one, it was kind of out of sequence to what was necessary for my own well being. So I realized that I needed to brush my teeth after I ate my breakfast. And that way by wasn’t walking out the house with little bits of things in my in still in my mouth, that really disrupted my whole world. Because I was like, Well, no, I get up in the morning. And then I do all these things all together and was really efficient, but actually lacked effectiveness. So understanding that some things are out of sequence, by virtue of you not thinking about doing them efficiently. And some of those things are going to have to be out of the sequence you want them to be because of just good practice, right? What, what’s best for you. So you need to kind of give some thought there to where do you feel pain points, because things are just not working the way they they should be. And that’s where you can really find the greatest benefit. And again, as we said, at the top of the show, most of that’s probably going to be based on your conflicts with other people if you live with other people. But then if that’s not the case, then think about the things that frustrates you about your morning. And those are probably the low hanging fruit for you to be able to somehow remaster to be better for you in your routine to just build a better routine, then start to look at the way in which things are sequenced, and whether or not that’s the best are using the best tools, right? Are you know, are you using the best toothbrush? You know, are you using the best toothpaste, all of those things level up your game as it relates to those things. I know I keep talking about brushing your teeth and dental practice. But it’s just the thing that comes to mind when I think about morning routines. But I’m is this goes across the board, right, every part of your morning, start to think about what are the skills necessary to do it best. That way, you can just do it better, you don’t have to do it best, you could just do it better. And therefore you’re choosing the right things to do in the right sequence. And that’s going to naturally make you do a little bit of research. And in that research process, you’re going to learn Okay, well, actually, I’m supposed to do this, before I do that, or you know what, it would be really helpful if I did this. At this time, I could be listening to an audio book while I’m on the recording stationary bicycle in the morning, or while I can listen to this podcast while I’m on the treadmill at the gym, these these are things that you can start to kind of fit together like a little puzzle that eventually creates a picture that seems cohesive and consistent for your life. Because it’s art said, this is really all about you having it this is your life, it’s your opportunity to take control over that space. And if you’re going to do it every day, if you’re going to have to experience this every day. It should be a picture that you like that you enjoy. I’d be curious to hear anybody who listens to this if they’d be willing to share their routines in the comments. routines are such a personal thing that we can all learn from each other’s routines, so couldn’t agree more. So with that this is going to wrap up this episode of productivity cast if you have a question or comment about this cast, or if you’d like to share your productivity routine. As art said, please do free to if you’re listening from anywhere other than the podcast website, please head over to the website at productivity cast dot net there at the bottom of the page, you can leave a comment or question one of us will be glad to respond. You can also send us a private message by clicking on the Contact link on productivity cast. NET while they’re at productivity cast dot net, you’ll also find our show notes. So the links to anything that we mentioned here during the episode are there you can easily jump to those links. And you can also learn to subscribe to the podcast on the website. If you’re not already a subscriber thanks to Francis and art for joining me here on this cast. Also, if you’d like please leave a rating and review there on iTunes or Stitcher or wherever you might be listening to us. Just for the kudos, we like to. We like to know that you’re listening and to help us grow our personal productivity listening community. And so thank you. Thank you for listening. Thank you for subscribing. That brings us out to the close of this episode of productivity cast, the weekly show about all things personal productivity, I’m Ray Sidney-Smith with Francis Wade and Art Gelwicks. Here’s to your productive life. And that’s it for this productivity. Cast. The weekly show about all things productivity with your hosts Ray Sidney-Smith and Augusto Pinaud with Francis Wade and Art Gelwicks.